March 31, 2019: Irene filled in. March 24, 2019: Dave Mandl filled in. 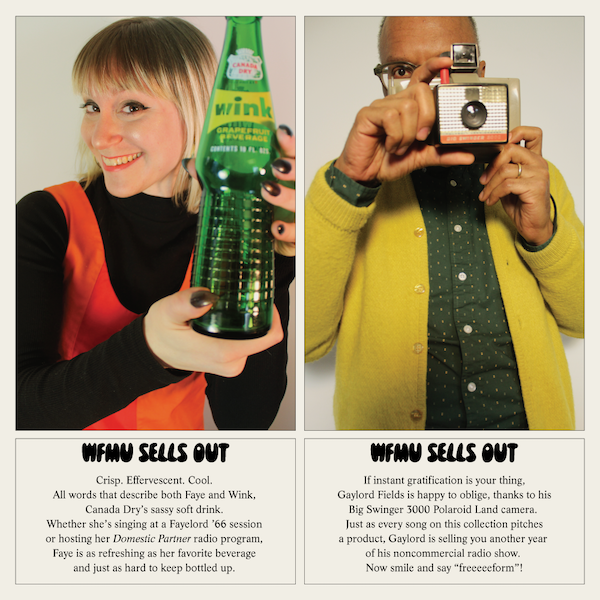 March 17, 2019: No show tonight due to the 2019 WFMU Fundraising Marathon Grand Finale. December 30, 2018: Keilidh filled in. December 2, 2018: Suzy Hotrod filled in. November 4, 2018: Sasha filled in. September 9, 2018: Nazario Scenario with Amanda filled in. September 2, 2018: Hello Children with Faye filled in. July 8, 2018: Double Dip Recess with Roger and Amanda filled in. July 1, 2018: Paid By the Tear with Sasha filled in. June 3, 2018: Dark Night of the Soul with Julie filled in. May 27, 2018: Frank O’Toole filled in. February 4, 2018: Shocking Blue with Delphine Blue filled in. January 28, 2018: Shocking Blue with Delphine Blue filled in. January 21, 2018: Shocking Blue with Delphine Blue filled in. January 14, 2018: Jack Mello filled in. December 31, 2017: Kurt Gottschalk filled in. November 12, 2017: Delphine Blue filled in. November 5, 2017: Therese filled in. October 8, 2017: Frank O’Toole filled in. August 13, 2017: David S. filled in. August 6, 2017: Michele filled in. July 2, 2017: Sasha filled in. June 25, 2017: Scott McDowell filled in. May 14, 2017: Julie filled in. April 16, 2017: Sasha filled in. January 15, 2017: Frank O’Toole filled in. January 1, 2017: Kurt Gottschalk filled in. May 1, 2016: Monica filled in. January 17, 2016: Cheyenne filled in. December 13, 2015: Tamar filled in. November 15, 2015: Circle Time with Mark R. filled in. October 4, 2015: Bill Mac filled in. August 23, 2015: Ning Nong filled in. July 19, 2015: David S filled in. June 28, 2015: Dan Bodah filled in. May 17, 2015: Samantha filled in. February 22, 2015: Ira K filled in. February 15, 2015: Hello Children with Faye filled in. September 14, 2014: Scott McDowell filled in. August 17, 2014: Monica filled in. August 3, 2014: Jack Mello filled in. June 29, 2014: Jason Sigal filled in. June 15, 2014: David Suisman filled in. May 4, 2014: Todd-o-phonic Todd filled in. December 15, 2013: Jeff Mullan filled in. November 24, 2013: David Suisman filled in. October 6, 2013: Tamar filled in. September 8, 2013: Bethany filled in. July 14, 2013: Mike Sin filled in. June 30, 2013: Jack Mello filled in. June 16, 2013: Tamar filled in. June 9, 2013: Ira the K filled in. April 7, 2013: Bethany filled in. February 24, 2013: Hatch filled in. February 17, 2013: Jason Sigal filled in. December 9, 2012: Keili filled in. November 25, 2012: Mike Lupica filled in. November 18, 2012: PGB filled in. September 23, 2012: Martha filled in. August 19, 2012: Woody filled in. May 13, 2012: Hello Children with Faye filled in. April 22, 2012: Amanda filled in. November 13, 2011: Dave Mandl filled in. September 18, 2011: Woody filled in. August 21, 2011: Bethany filled in. June 26, 2011: Tamar filled in. April 10, 2011: Dave Mandl filled in. February 20, 2011: Mary Wing filled in. October 31, 2010: Steve Krinsky filled in. September 26, 2010: No show today. September 5, 2010: No show today because of the All Tomorrow's Parties live broadcast. August 22, 2010: Bill Mac filled in. July 18, 2010: Keili filled in. June 6, 2010: Bethany filled in. December 13, 2009: Keili Hamilton filled in. September 27, 2009: No Show due to the Jersey City power outage. September 20, 2009: Show not archived due to technical difficulties. August 16, 2009: Robin filled in. July 12, 2009: Tony Coulter filled in. April 12, 2009: Tony Coulter filled in. November 2, 2008: William Berger filled in. October 5, 2008: Evan Muse filled in. September 14, 2008: Evan Muse filled in. September 7, 2008: Donna filled in. July 6, 2008: Acapulco Rodriguez filled in. May 11, 2008: Todd-o-phonic Todd filled in. April 6, 2008: Tamar filled in. March 2, 2008: Yo La Tengo play the 2008 Marathon (archive unavailable). January 20, 2008: Dan Mackta filled in. September 30, 2007: Robin filled in. August 5, 2007: Debbie Daughtry filled in. July 15, 2007: Michael Goodstein filled in. May 27, 2007: Robin filled in. May 20, 2007: Debbie filled in. April 22, 2007: Rix filled in. October 15, 2006: Debbie filled in. October 8, 2006: Rix filled in. September 3, 2006: Robin filled in. August 20, 2006: Bob Weyersberg filled in. Due to a turntable glitch, there is a great deal of distortion and noise on many of this program's songs, rendering them difficult to listen to. October 16, 2005: Frank O'Toole filled in. October 9, 2005: Bronwyn filled in. September 4, 2005: Debbie Daughtry filled in. July 3, 2005: Dennis Diken filled in. May 22, 2005: Debbie Daughtry filled in. May 15, 2005: Robin Edgerton filled in. February 13, 2005: Yancy filled in. December 5, 2004: Robin filled in. November 28, 2004: Mister C filled in. September 19, 2004: Tamar filled in. June 20, 2004: Robin filled in. June 12, 2004: Bob W filled in. March 20, 2004: Yo La Tengo Take your requests! With Marathon Co-Host Tom Scharpling. Not available on the archives. February 21, 2004: Tamar filled in. February 7, 2004: Maryann filled in. December 27, 2003: Dorian filled in. November 15, 2003: Bob Brainen filled in. October 11, 2003: Yancy filled in. September 14, 2003: Robin filled in. September 7, 2003: Robin filled in. June 29, 2003: Maryann filled in. June 7, 2003: Maryann filled in. March 29, 2003: Maria filled in. March 1, 2003: Hova filled in. October 12, 2002: Robin Edgerton filled in. September 14, 2002: No show today. Trouble filled in. September 7, 2002: Pseu Braun filled in. August 17, 2002: Eva Neuberg filled in. Click here for Eva's archives. July 6, 2002: Maryann Ciba filled in. Click here for Maryann's archives.